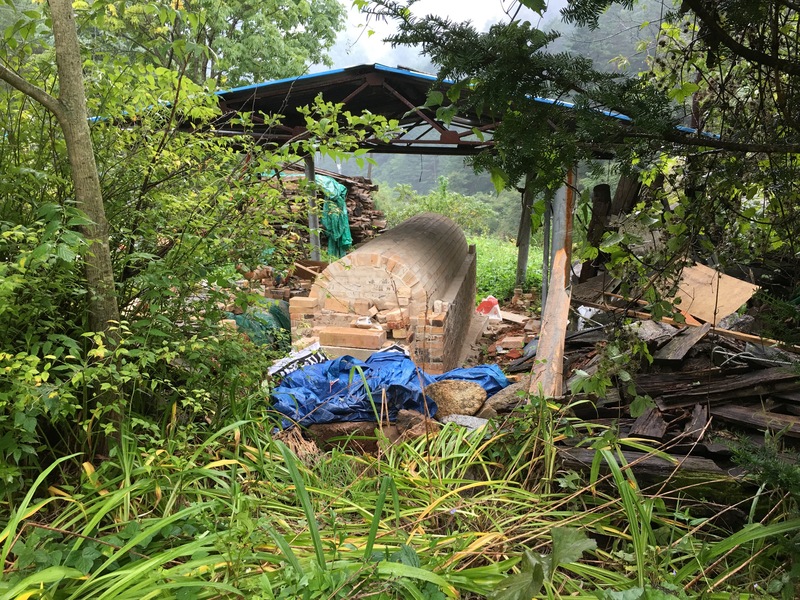 I am in Korea, searching for ancient sites where porcelain stone has and/or still is being mined for the creation of porcelain in the old-fashioned way. We set off in the late afternoon having wasted quite a bit of time unnecessarily here. We drive into the evening and on into the night. We have a way to go up the East Coast to the hight range of mountains that will be near where the home of the next Winter Olympics will be held. It’s a cool damp place this night. On the way, Mr Jaeyong gets us to stop off at this grandmothers house, where he has to collect something. 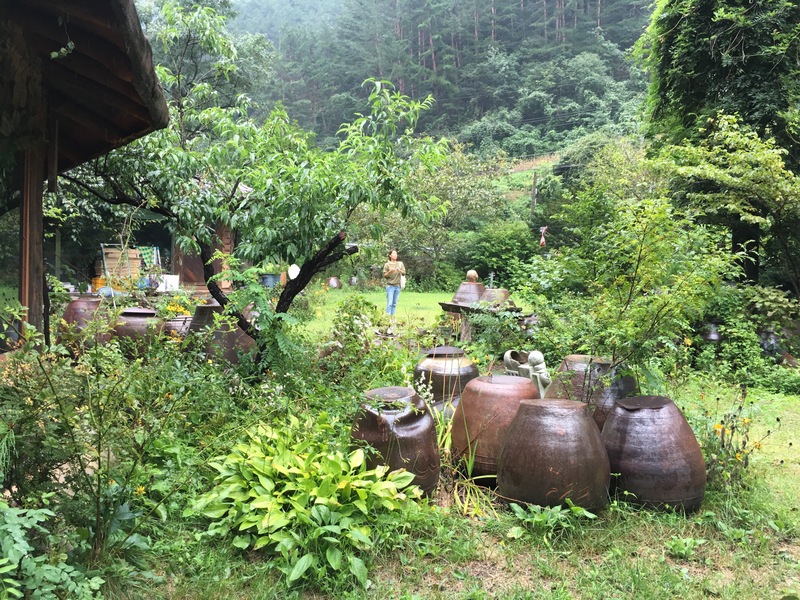 It’s a beautiful old traditional Korean farm-house. His grandmother appears to be quite elderly, but still quite energetic and vital. She still tends the large vegetable garden in the front area of her land along the driveway coming in. It’s really beautifully picturesque, and a real credit to her and her tenacity and ability for hard work. I love it! Mr Jaeyong had invited me to stay here while I worked in the porcelain Centre, had I stayed on and he would have taken over as my interpreter, but that hasn’t eventuated. Pity, I would have loved it here. I’d have done a bit of weeding to earn my keep. While Miss Kang drives, we talk about our experiences of the last two days. What was going on there? We are both at a bit of a loss to come to some sort of clear idea, but as we discuss it, our ideas clarify. My best bet is the we have encountered a corporate ‘yes’ man who just wants a simple, uncomplicated life, and I have come along against all warnings and blundered in an asked him to do something, that although he is paid to do it. He doesn’t want to have to. He wants the wage, he doesn’t want the work. Simply because it is just too hard and a lot of unnecessary bother. I made his life hard for him. I’m the problem. There might also be a bit of a parochial attitude mixed in there too? Of course, he could have just said. “Here take this pack of clay, no-one will ever know. But please don’t tell.” It could have been so easy. I would have honoured that and exhibited a pot of Korean Stone, but not directly identified to his site. I will eventually write to him, but I won’t be rushing to do it. Maybe after we get back, I’ll drop him a thank you email note? I really did want to exhibit a pot made from this southern single-stone clay in my show at Watters next year. It would have made the exhibition really comprehensive, but that isn’t going to happen now. I have work that I have made in all 5 countries where singe-stone porcelain has originated, and in several workshops in each of these places, using differing local versions of their single-stone clay. Also obtaining various selected batches of the local bodies made in different clay making workshops and factories. I also have work that I have made and fired at home in my own kiln, made from all these same single-stone bodies that I have shipped home over the years to continue the research, by making and firing these same clays in my own wood fired kiln. We move on to more interesting and uplifting conversations about life, pottery, organic gardening. Whatever crops up as we travel. It’s a long drive. We find Mr Jaeyong’s place without too much trouble, as Miss king has the location plotted in the maps app in her phone. I feel for this young lady, having to drive such long distances. Especially when it is dark and rainy like this. Mr Jaeyong’s place is perched halfway up a mountain, in a clearing on the edge of a precipitous drop into a forested valley. We don’t know this when we arrive in the dark and misty rain. Mr. Jaeyong has driven fast and arrived before us. The lights are on and he is there to guide us into a little parking space between two buildings. There are several little buildings clustered around an open grassy clearing. There are gardens and loads of pots decorating the spaces between the various pavilions. My first impression of the set up in the dark and rain is that it is very pretty. I can’t wait till morning to get a better look in day light. We each have a different building to sleep in, each with it’s own on-suit. I’m very impressed. Apparently the place’s owner is currently studying wine making in Australia. At least that is what I think I was told. Jaeyong welcomes us into his kitchen/dining room building. It’s warm and dry and very cosy. We even have WiFi internet. Jaeyong cooks us a very nice meal. It transpires during our conversation through this cooking process, that this place is snowed under for 3 to 4 months of the year and is not habitable. My Jaeyong decamps to somewhere warmer during this time. 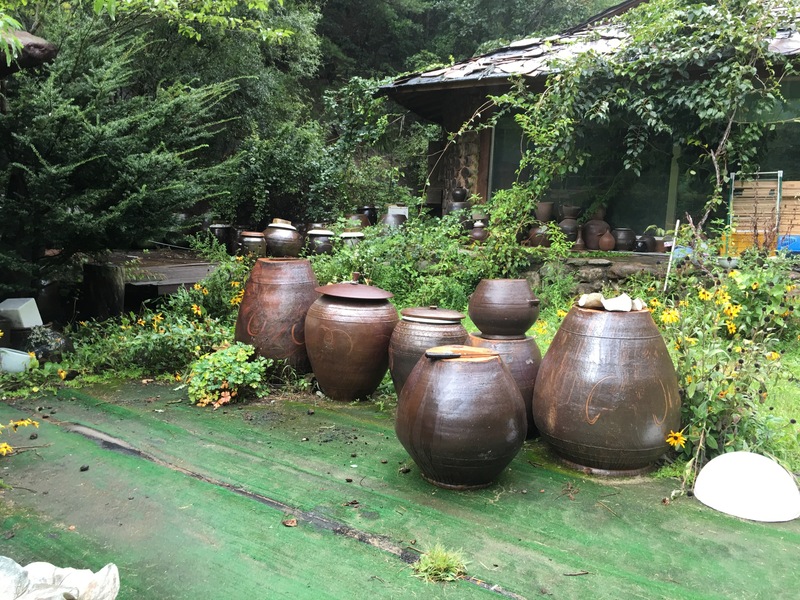 Like his grandmothers farm-house down south, or somewhere overseas to study pottery making around the world. He rattles off quite a list of countries that he has visited to study ceramics. He hasn’t been to Australia yet, so I welcome him, should he make it to Oz. I will return his hospitality. 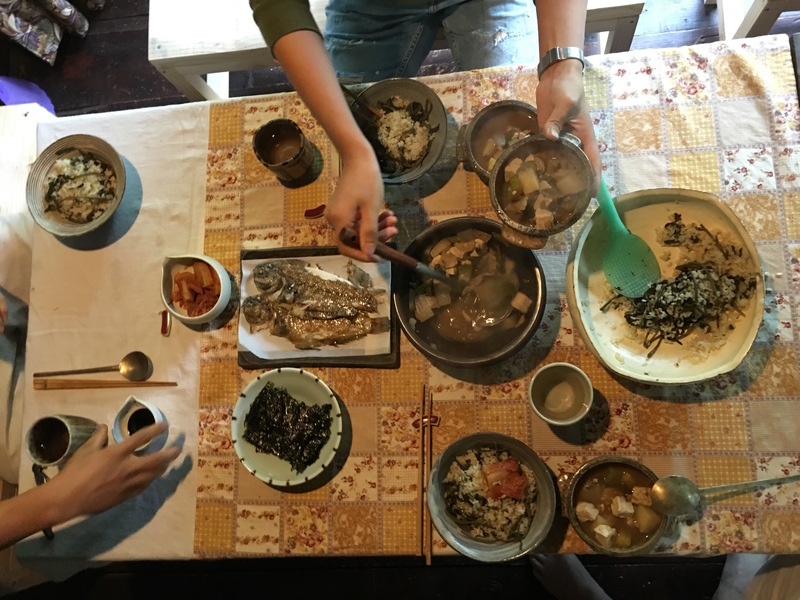 We dine on a very nice traditional Korean meal of rice with soup and a host of other small vegetable and pickle dishes. It’s all extremely warm and welcoming and satisfying to be accepted into someones home like this. So openly and graciously, just as Jun Beom and his family have done in Yeo Ju. Eventually our conversation return to our difficulties of the morning. Mr Jaeyong offers the opinion that the Manager and Master Initiator is just doing his job, the way he has decided to interpret it. We should feel sorry for him, stuck in his life the way that he is. We eat our beautiful meal, we talk, drink a beer and then some wine with the meal. It’s all so well presented. Mr Jaeyong has gone to some trouble. These two wonderful people talk in Korean in short bursts, but then stop and one or the other interprets for me, sometime the discussion continues in English for my benefit. Mr Jaeyong had to work with people like that when he worked in a public service job years ago. They suffer from ‘bureaucratic brain syndrome’. It’s all a bit tragic really. They need our sympathy. I take this onboard. I consider my reactions and attitudes. Mr Jaeyong is very generous and open-minded. I look deep into my self and reflect on my own stance, perspectives, predudices and viewpoints. I should have some sympathy for this guy. I look harder and quiz myself more deeply. No, there is nothing there for him. Just a blank. I fail this simple test of humanity and compassion. But I am who I am, and I try to be the best person that I can be. I’m just flawed, but in a manageable way. I wish no ill on any other person. I guess that I just don’t have the energy to send out anymore good will out into a void. I haven’t been sleeping well with the jet lag and everynight in a different bed. I’ll put my failings down to that. It’s an easy excuse. 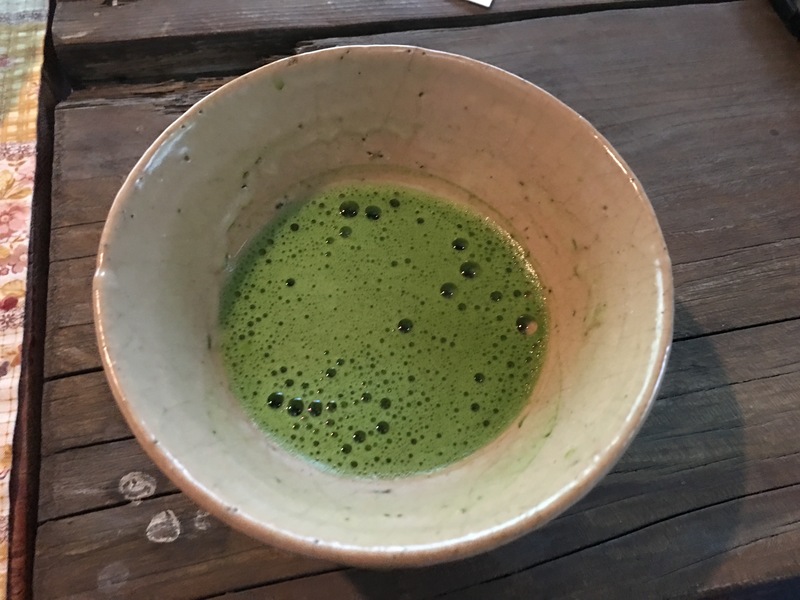 Mr Jaeyong makes us a bowl of green tea to cap off a delightful meal. This is very much in the Japanese style. 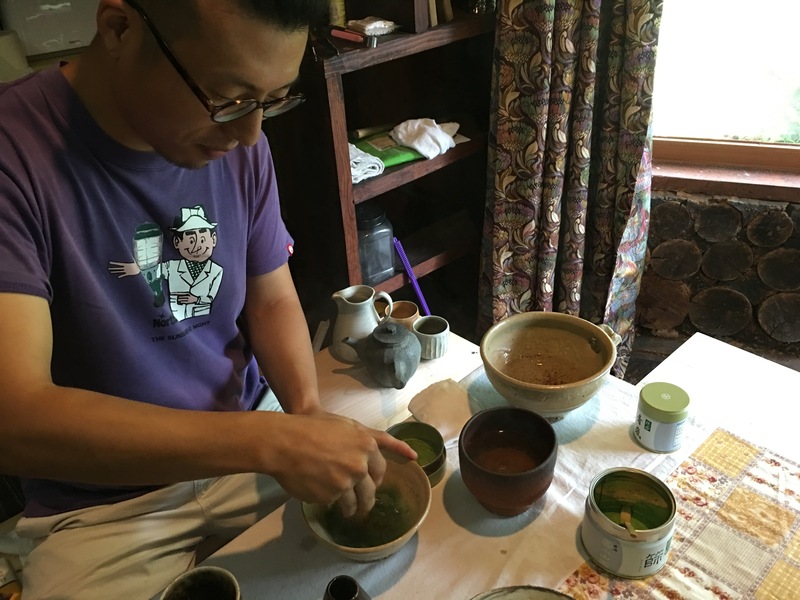 He has spent quite a bit of time in Japan I gather, working with potters over there to broaden his understanding and training and to enrich his skill base. In the morning I awake to a bright sunny day, cool crisp air in the lingering mist up here on this mountain. I wander around the garden and take it all in. It a sort of remnant, Hippy commune style cluster of hand-made buildings, none of which would get building approval from my local council back home. It is beautiful in its sprawling ramshackle way. I love all the clusters of big, dark, ‘ongi’ jars scattered in clumps all around the garden. I walk around the site, the view is great. The atmosphere is terrific. His kiln is almost finished. I wish him luck with it. I’m certainly glad that I don’t have to be here right up until the show closes off the road and the place sits idle for 3 to 4 months. 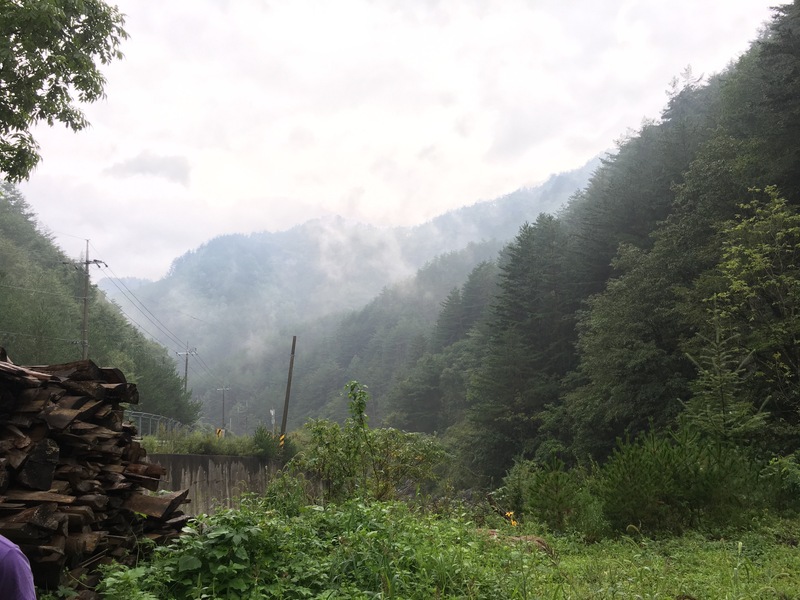 We set off early, as we are all on a mission to explore deep into these remote mountains to locate the ancient single-stone porcelain site and try to recover a small sample of the stone for my collection. I already have a small sample courtesy of the clay processing factory in Yeo Ju. I just need to see it in-situ and be able to compare if there are any differences. Perhaps there are more choices, different veins, whiter grades? Best wishes from Steve in Korea. This entry was posted in Korea, single-stone porcelain by hotnsticky. Bookmark the permalink.